The Best Whitianga Boat Trip on offer! Cruisy Sailing Charters, Extreme America's Cup Foiling or a Sailing Charter adventure personalised to you. Let the wind fill your sails! 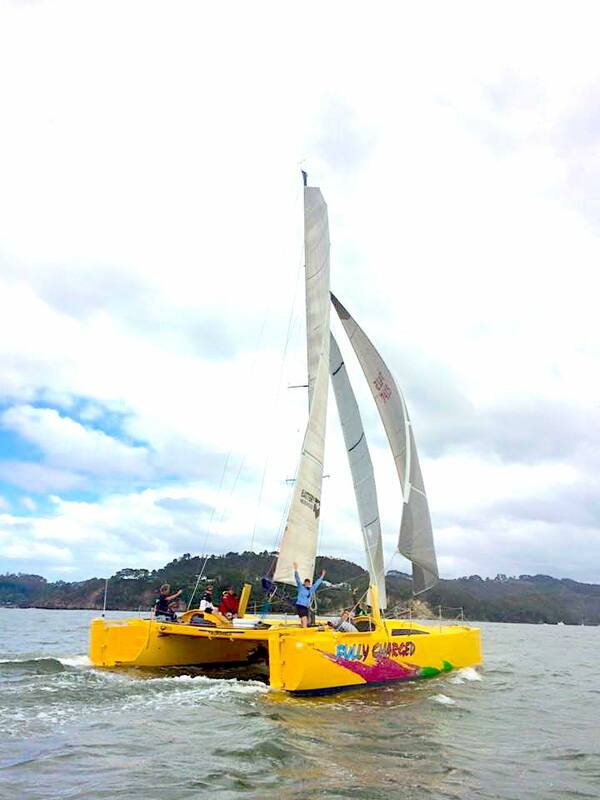 Come on an action packed or chilled out exploration of Mercury Bay by sail, taking in Coromandel icons, Cathedral Cove, Hahei Marine Reserve, Cooks Beach and beyond from either our offshore racing grade catamaran or an America's Cup style foiling yacht. -Live the America's Cup style foiling experience. New Zealand is the home of the America's Cup. Live your America's Cup dream with Boom on the original prototype catarman that Team New Zealand honed their skills on! -Not a morning person? Sweet as! Jump on a cruisy 3hr afternoon sail sailing charter aboard Fully Chargedcomplete with complementary craft beer and wine exploring Mercury Bay, Cathedral Cove and surrounds. -Quite simply the most ultimate team building experience ever - learn to sail like Team New Zealand on an America's Cup style foiling cat with the Boom Team including some of the engineers that developed Excess. -The sweetest way to see the bay when the sun is dipping and the air is cool and the drinks taste sweeter! - Jump on a 2hr evening NZ sunset cruise with Coromandel food, wine and craft beer, departing daily. -Spend a full day or longer on Fully Charged, & explore the Mercury Bay & Cathedral Cove or further afield at the Mercury Islands. On a Private Charter we can move at your pace, teach your group to sail or just chill and enjoy the ocean. The Ultimate Sailing Charter - Fully Charged for Pure Sailing Fun! Full Charged is the ultimate in sailing fun! We looked far and wide for the ultimate sailing machine to run sailing charters out of Whitianga, and when we laid our eyes on 'Fully Charged' we knew it was the one! Fully Charged is a powerful coastal racing catamaran, designed by one of New Zealands best ever yacht designers and modified for relaxing day sailing - she charges along at a fine old clip in even the lightest of winds, when it is blowing, hold on she is a pocket rocket! Fully Charged is a Maritime New Zealand surveyed vessel operating under a Maritime Operator Safety System. She has hit the mark in Whitianga as a sailing charter boat and made the holidays of explorers from all around the globe for the last three years. With her spacious trampoline decks you can laze back and enjoy the wind in your hair and the epic views. Of course you could ask Capt Mat or Capt Tom a few things about sailing along the way, chances are at some stage on the trip they will even let you take the helm or tweak the sails. There is nothing they love more than seeing people learn something new about sailing. Sailing is in our blood in New Zealand. We have a proud history of taking on the best in the world in Round the World Sailing races and winning, and of course our nations love affair with the America's Cup. Now you can experience what America's Cup foiling is all about right here in Whitianga on our America's Cup foiling catamaran, Excess. Available as a fully guided adrenaline packed sailing charter experience on the Coromandel. An adventure on Excess is perfectly suited as a team building event, or someone wanting to experience the thrill of America's Cup racing. Much like America's Cup sailing we have very strict wind windows that we can sail in. It pays to allow some lee-way either side of your planned booking so we have the best chance of getting you on the water. As far as conditions go, Whitianga would rate as having some of New Zealand's best sailing charter conditions. Get kitted out in full America's Cup racing kit and step aboard this pocket rocket. Feel the thrill as Excess gets up on its foils and hits warp speed! We've got a sailing trip to suit every visitor to Whitianga. We also do private sailing charters by arrangement - perfect for families, events and corporate groups. Let the Wind Fill your Sails! The crew at Boom Sailing are fizzing to get you out on the water and into some Pure Sailing Fun. The Coromandel is made for Sailing so what are you waiting for, let's go do it!